Friday was also the the day that Grahame Bessey paid a further visit to Norwich. 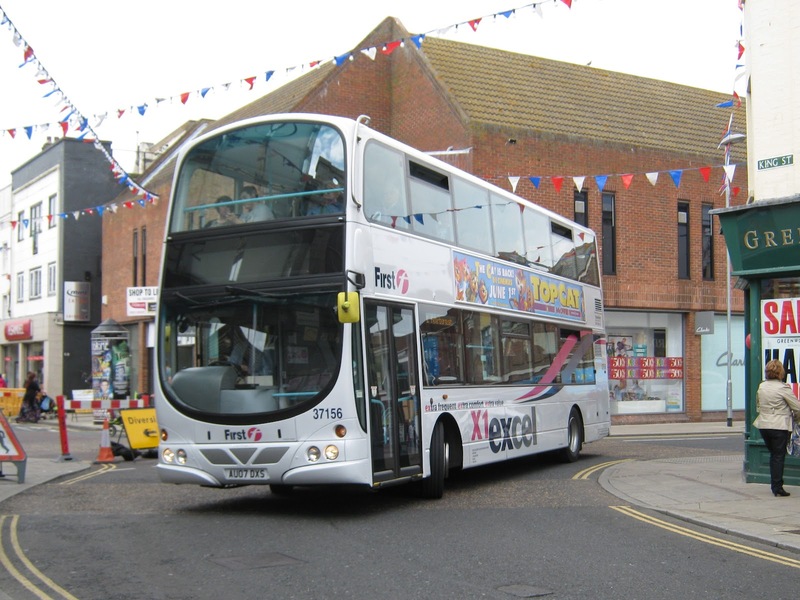 During his time there he saw both of the First Volvo B10BLEs transferred in from Great Yarmouth during the early part of the week. 60807 (left) was about to leave Castle Meadow for Wroxham on the 12 , whilst sister 60808 (right) was noted departing the bus station on service 14 for Silfield. 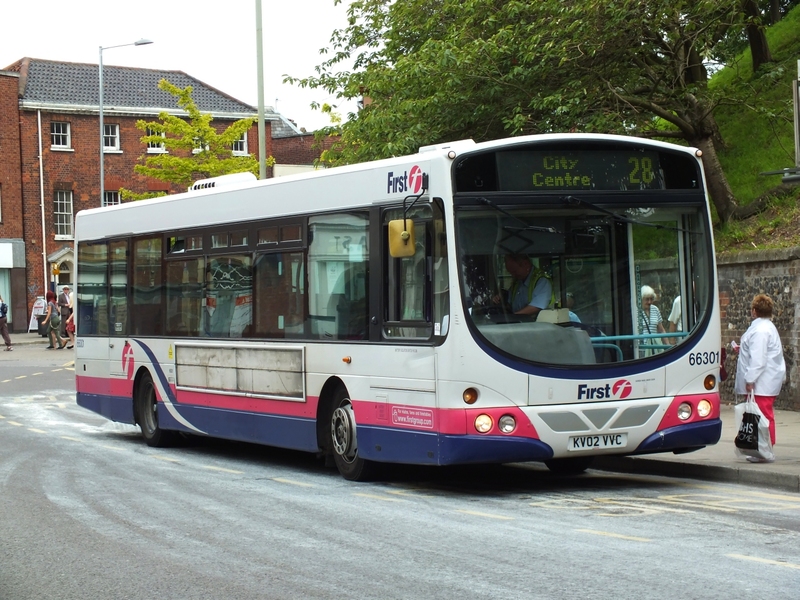 Grahame also reports that all moves between First Norwich and First Northampton have now been completed. 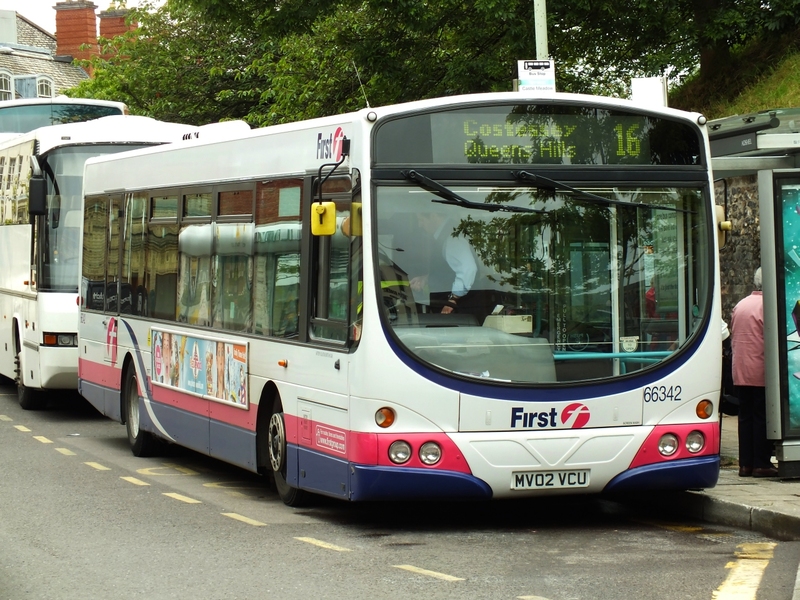 One of Northampton's former Volvo B7L/ Wright Eclipses was noted in service in Castle Meadow. The vehicle was 66301 (KV02VVC) and is seen heading west. Here 804 (BL57OXN), now in Konect colours, returns to Costessey on the 604 service. 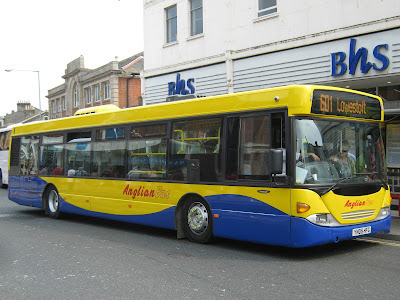 The bendybus was formerly with London General as their MAL111. A couple of hours spent in the town centre and holiday areas of Great Yarmouth this afternoon revealed the following activity. At the BHS stand was a former Metrobus Scania waiting for the 13:50 departure for Kessingland. 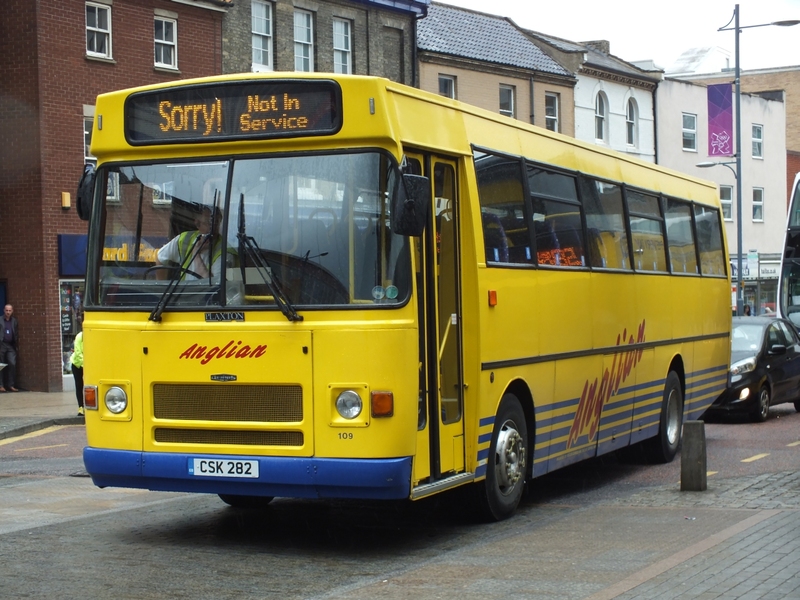 Now in Anglianbus colours as their 446, YN05HFG is one of the last received by the Suffolk operator. Behind it was Ambassador Travel's Volvo B12M 197 (KIG1857) which was providing some additional luxury for the shoppers on the Asda Free Bus. 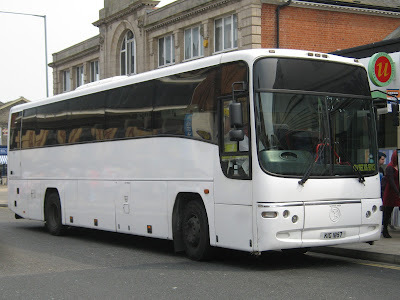 KIG1857 was formerly FN52HRM and had previously seen use on National Express work prior to its demotion to general fleet duties. Proceeding to the seafront I was keen to observe the Our Bus Seafront Circular which resumed summer operations earlier in the week. Whilst waiting I was passed on North Drive by First's Routemaster RML2480 (JJD480D) heading for the Seashore Holiday Centre. 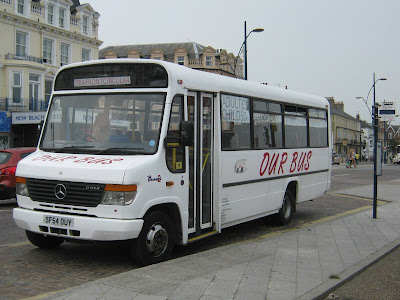 Soon after, I sighted Our Bus SF54OUY - a Mercedes Benz Vario O814D with Plaxton Beaver bodywork. It was the regular vehicle operating the service last year and I managed to capture it at the Britannia Pier stop. Unfortunately with grandparent duties taking up much of my time recently, I have not been able view/post much activity in the last few days. However, Grahame Bessey reports that Great Yarmouth's Caister Road depot has lost three of its Volvo B10BLE's to other depots within the First East of England fleet. 60807 (S658RNA) and 60808 (S659RNA) have moved to Norwich, whilst 66165 (W365EOW) has gone to First Essex. The latter, which has subsequently been sighted at Basildon, is seen here at the Caister Road site during March of last year. 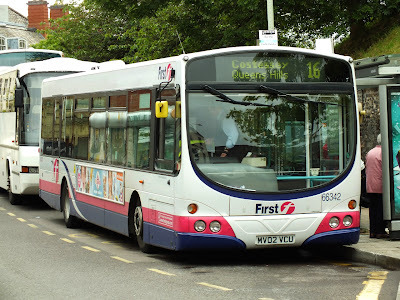 Contributor Syd Eade reports there was a surprise visitor on Lowestoft town service 101 on Saturday. 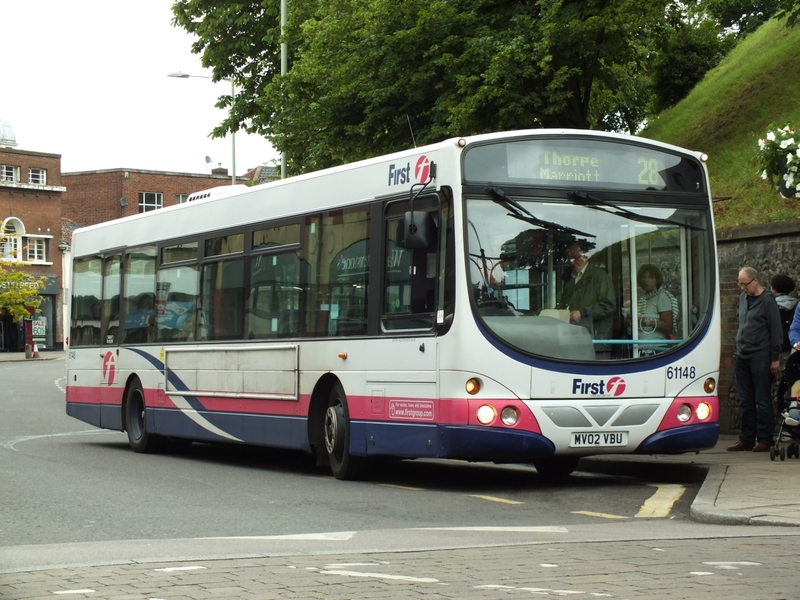 Syd was fortunate in getting a photo of Great Yarmouth based 32202 (LT52WTG) working the route on Katwijk Way. 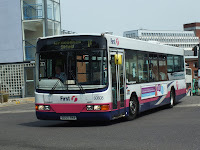 He says that Plaxton Presidents are quite rare at Lowestoft these days, and of course the 101 is an SLF route. He also reports that one of Anglian's recently acquired Scanias left the road at North Cove yesterday afternoon after being involved in a road traffic accident. He believes it was 445 (YN05HFE) which was later confirmed by an Anglian driver. 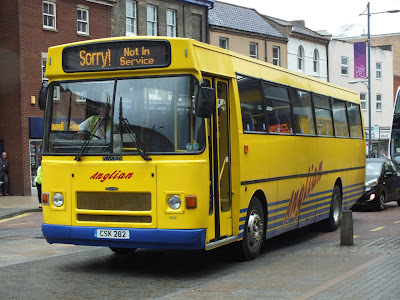 Syd also saw sister vehicle 442 (YN05HFH) in service in Lowestoft yesterday, but exactly what it was doing is a mystery as no destinations were shown and not even a card in the window! He guesses it was probably on the 601 service. An unusual visitor to Beach Coach Station today was a double deck coach from a Norfolk operator. 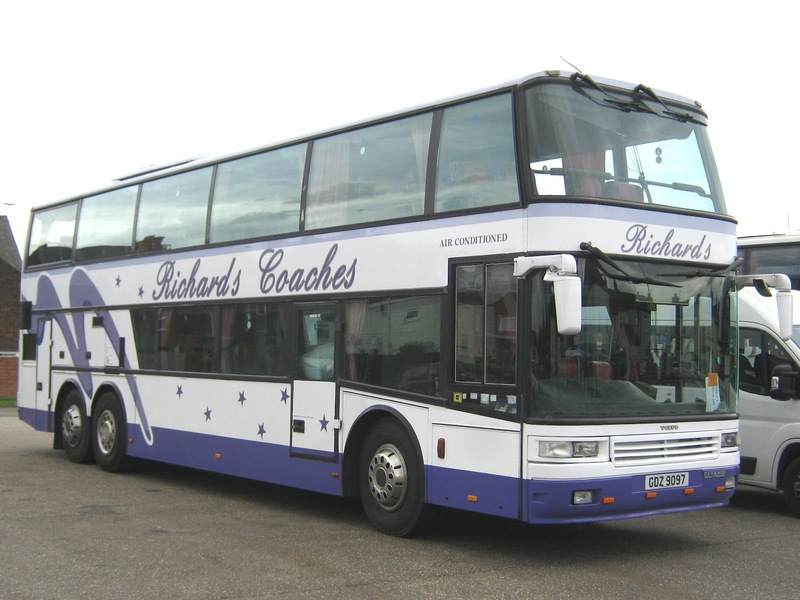 Guist-based Richards Coaches' Volvo B12T GDZ9097 arrived just before 2.30pm this afternoon. It has Berkhof CH57/16CT bodywork and was new to Ferris Coaches of Nantgarw (near Cardiff) in May 1998 as their R157RJH. Among those also on site were Shearings Volvo B12M 603 (MX04AEC) and Whippet B10M J688LGA. The latter had arrived on Coastal Service A from Cambridge via Newmarket. As promised, a posting on the bus/ light rail operations observed whilst on a 17 day trip touring around parts of the USA. Our 'tour bus' (as the American's call it!) was this All Aboard America's Prevost number 545 operated by Industrial Bus Lines of Carlsbad in New Mexico. Prevost is a leading North American manufacturer of intercity touring coaches with more than 80 years of experience in the bus industry. Free WiFi enabled, (a bonus!) our bus was expertly driven over the 2,300 miles by our Phoenix-based driver Bruce. Our first base was in Denver with our hotel being a couple of blocks from the main shopping mall on 16th Street. 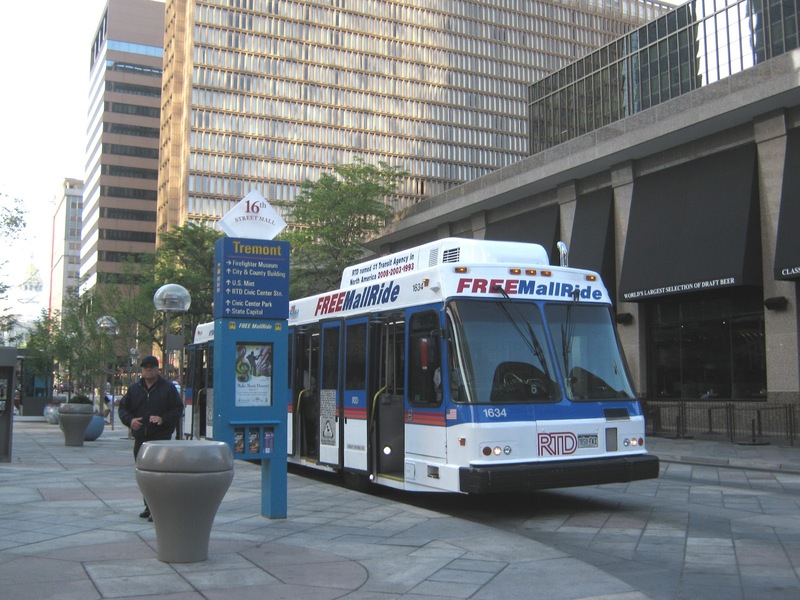 Free buses operate throughout the length of the mall with stops at every block between Union Station and the Civic Center. Operated by Regional Transportation District (RTD) the hybrid electric powered vehicles drive through the pedestrian area. Our first destination was Red Rocks Park, where its amphitheatre is a geological phenomenon; the only naturally-occurring, acoustically perfect amphitheatre in the world. 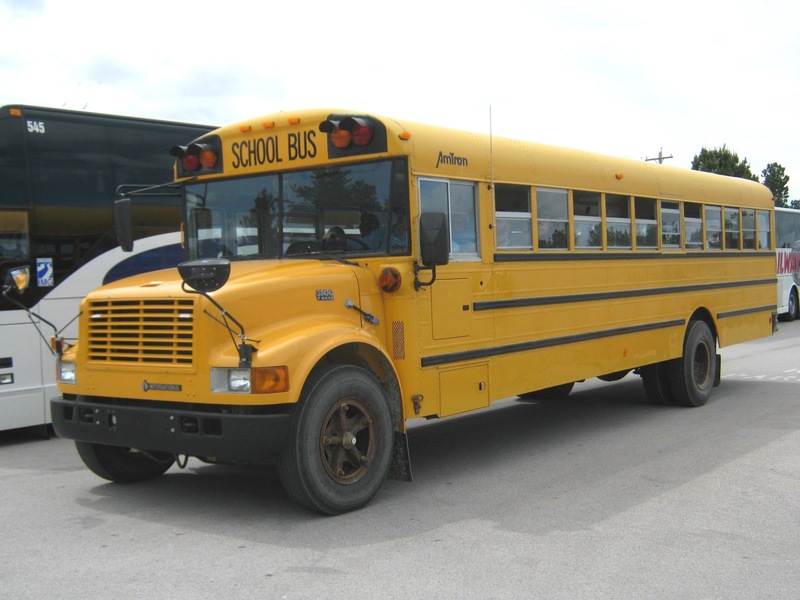 School bus builder AmTran was founded in 1980 and is short for the American Transport Corporation. This example is pictured at the Crazy Horse Memorial in South Dakota. Jackson, Wyoming was another interesting place to visit. Not only does it provide the gateway to the Grand Teton and Yellowstone National Parks, it also has a public transport system known as START. Salt Lake City was next on the agenda and the Utah capital is home to a bus and light rail system and both are operated by the Utah Transit Authority (UTA). 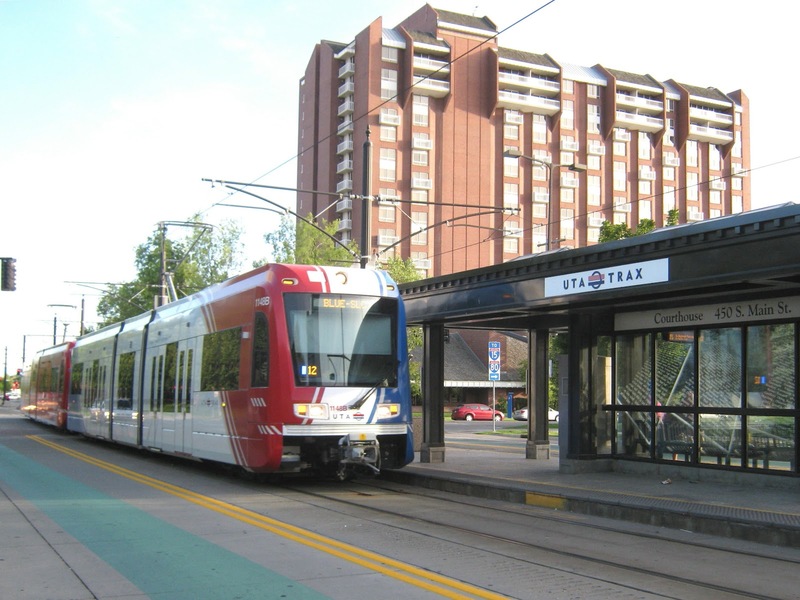 The photo shows bus 12022 travelling southbound along State Street on the 200 route heading for the TRAX (light rail) Station at 5300 South Murray. A very enjoyable, but hectic holiday - I now need another to recuperate! 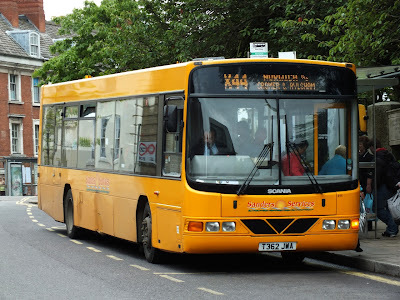 The first vehicle observed was Shearings Volvo B12M 502 (MX03AAF) in the old Shearings livery. Some of the coach parking has been given over to car parking to replace some of the spaces lost to the new housing development - the amount allocated to coaches was quite generous. The new access has been completed but is not yet in use. New Buses for the X1? Gerard reports the vehicles are currently parked in a location north of London labelled for Olympic use but with X1 branding. The livery is different from the current one and it is believed the lower bodysides are burgundy. The seventeen buses (not 22 as hoped for) have leather seats and and are rumoured to have more powerful engines than the current fleet. We will just have to wait and see what happens after everything settles down following the Olympics. 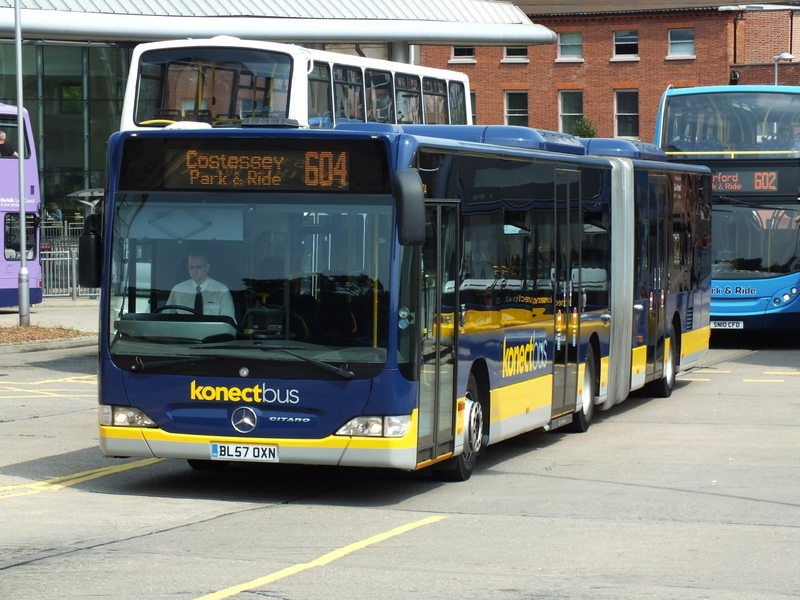 A reliable source has subsequently advised that here are NO replacement X1 vehicles in the Olympic fleet, although discussion is shortly to take place on replacing the Gemini's in next year's vehicle allocation. 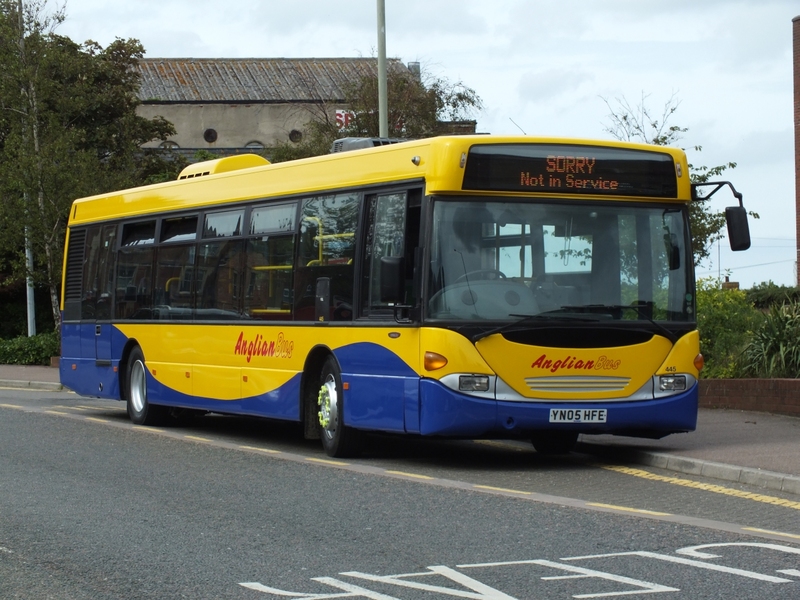 The most significant changes locally involve the reintroduction of the Great Yarmouth Seafront Circular by Our Bus and a change of operator for the 878 service between Alpington Village Hall and the Great Yarmouth Colleges. Other Details: College days only. Other Details: 21/7/12 to 2/9/12. 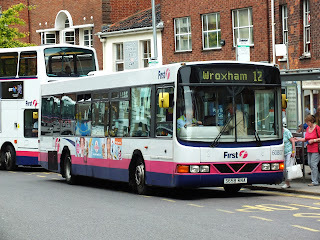 Operating between LOWESTOFT BUS STATION and NORWICH, ALL SAINTS GREEN given service number X2 effective from 24-Jun-2012. To amend Timetable. Operating between Lowestoft, Dip Farm Car Park and Lowestoft, Marine Parade given service number A1 effective from 23-Jun-2012. To amend Timetable. 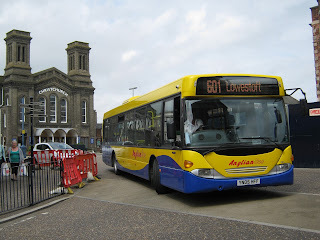 Operating between NORWICH RAIL STATION and ROYAL NORFOLK SHOWGROUND given service number 100 effective from 27-Jun-2012. To amend Timetable. 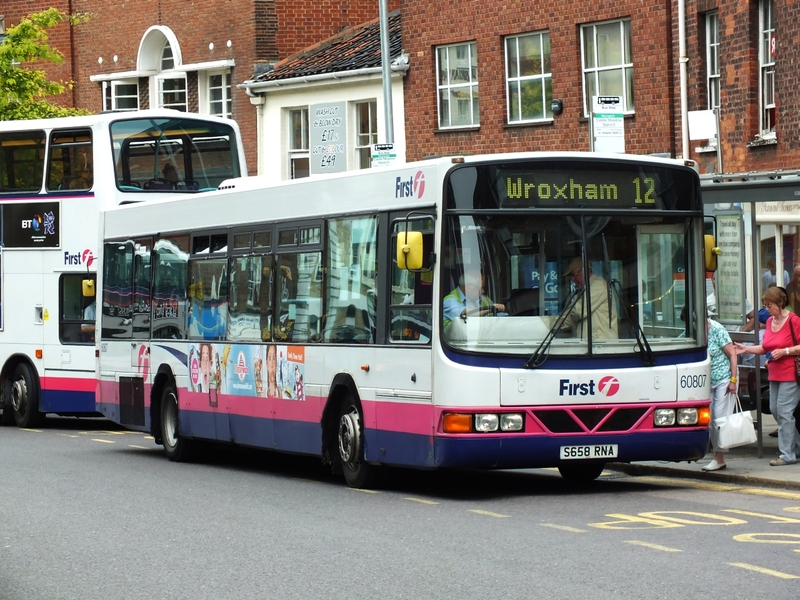 Operating between AYLSHAM MARKET PLACE and GORLESTON CHURCH LANE COLLEGE given service number 837 effective from 31-Jul-2012. Operating between Alpington and Great Yarmouth college given service number 878 effective from 21-Jul-2012. The fourth Scania Omnicity from London's Metrobus operation has been noted on the road in Anglianbus colours. This leaves just YN05HFG to be accounted for and, by a process of elimination, it should receive fleetnumber 446. Again my thanks to Grahame Bessey for the photo. Sister vehicle 66342 (MV02VCU) was also noted in Castle Meadow on a Costessey Queens Hills working. A third example was noted by Grahame at Norwich Bus Station off Surrey Street - 66336 (MV02VCC) was the vehicle in question. The Javelin previously carried the registration J127LHC and took the cherished plate on the demise of a Mercedes Benz O303. CSK282 is pictured on St Stephen's Street not in service - presumably it had worked a schools duty. The final photo is that of Sanders 33 seater Scania L94UB/ Wright Axcess-Floline T362JWA. Numbered 311 in the Sanders fleet, it seen in Castle Meadow on the X44 from the North Norfolk coast. T362JWA was new to Apcoa of Sunbury on Thames in May 1999. My thanks to Grahame Bessey for providing the good quality photos. Much activity in Great Yarmouth town centre this afternoon - both routemasters were active on First's service 3 and a diversion for buses was also in place. As reported yesterday on the blog, part of King Street was dug up to permanently repair the burst water main of last month. Yarmouth Way and onto Hall Quay for the resumption of their normal routes. Before the Regent Street bus lane was introduced, all Southtown/ Gorleston bound routes used Yarmouth Way. As it was unusual to see vehicles using this route I took a number of pictures of them doing so and the additional ones can be seen on my Flickr site. Repairs looked to be complete. 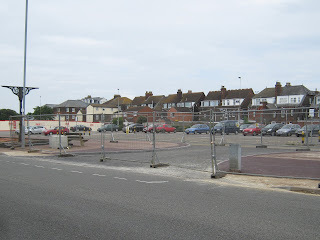 Work on the new access to Beach Coach Station is also nearing completion as my photo shows; so it shouldn't be too long before it is brought into use. 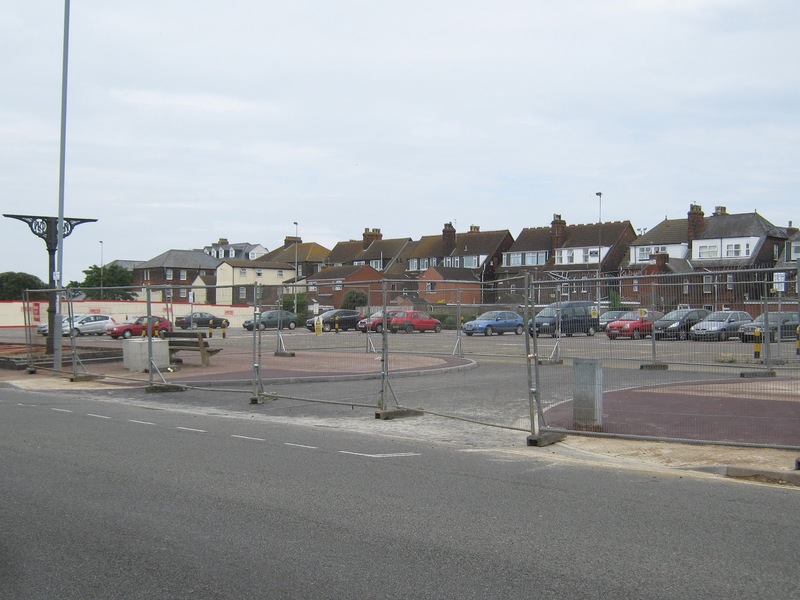 Workmen have begun digging up part of a road forming a major bus route in Great Yarmouth town centre following a burst water main last month. The incident happened in a busy shopping street, at the junction of King Street with Regent Street, on Saturday, June 23rd. The leak was temporarily repaired on the day of the incident and this morning contractors started work on a twelve metre by six metre area to repair the road permanently.